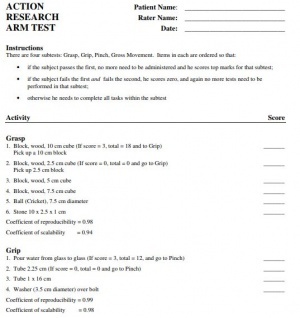 The Action Research Arm Test (ARAT) is a 19 item observational measure used by physical therapists and other health care professionals to assess upper extremity performance (coordination, dexterity and functioning) in stroke recovery, brain injury and multiple sclerosis populations. The ARAT was originally described by Lyle in 1981 as a modified version of the Upper Extremity Function Test and was used to examine upper limb functional recovery post damage to the cortex. 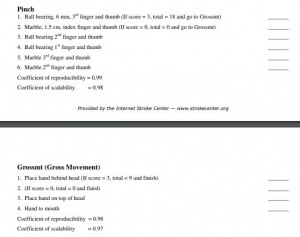 Items comprising the ARAT are categorized into four subscales (grasp, grip, pinch and gross movement) and arranged in order of decreasing difficulty, with the most difficult task examined first, followed by the least difficult task. Lyle proposed that this hierarchical ordering would improve efficiency of testing, as normal movement on the most difficult items would be indicative of successful performance on proceeding items. Task performance is rated on a 4-point scale, ranging from 0 (no movement) to 3 (movement performed normally). The ARAT has been standardized for individuals with stroke, brain injury, multiple sclerosis, and Parkinson’s disease. The test can be administered to individuals 13 years of age and older. Standard positioning for the ARAT has the subject seated upright in a chair with a firm back and no armrests. The head should be in a neutral position, with feet in contact with the floor. This body posture must be maintained throughout the testing period, with the trunk contacting the back of the chair. Feedback is provided as required, to prevent the subject from standing up, shifting laterally or leaning forward. To ensure that test items are performed unilaterally and that the non-test hand remains visible throughout the assessment, the subject is instructed to begin with both forearms pronated and hands resting on the table. Exceptions to this rule are for tasks within the gross movement category which require that the subject begins with bilateral forearm pronation and hands resting on the lap. The administrator then provides instructions to the subject to perform tasks within the grasp, grip, pinch and gross movement subscales, while scoring the individual based on their performance of each task. The administrator follows instructions provided on the scoring sheet when instructing the subject about the required task. 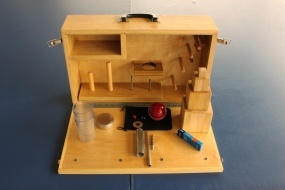 For grasp tasks (6 items), the subject is instructed to lift testing materials from the surface of the table to a shelf located 37 cm above the starting point. For grip related tasks (4 items), the individual grips testing materials and moves them from one side of the table to the other. Pinching tasks (6 items) require the subject to perform similar movements to those in the grip subscale, but with the use of a fine motor pincer grip instead. Gross movement tasks (3 items) require the individual to move their testing arm to different resting positions including on top of their head, behind their head or to their mouth. Subjects are first asked to perform the most difficult task within a subscale. If a subject performs the task adequately with normal movement, they are scored a 3 on this item and all remaining items within a subscale. A score between 0-2 on the first item suggests that the second task (least difficult) must be evaluated. Subjects scoring 0 on the second task item are unlikely to be successful on subsequent scale items and are scored 0 for remaining tasks within a category. Remaining moderate level tasks within a subscale are thus not evaluated. Otherwise, all test items within a category must be performed. Consequently, subjects may be asked to perform anywhere from 4 tasks to 19 tasks depending on their performance. Scores on the ARAT may range from 0-57 points, with a maximum score of 57 points indicating better performance. There are no cut off scores as this assessment is continuous and based on a subject's observed mobility. The ARAT can be used to predict the functional recovery of the upper extremity in stroke rehabilitation. Scores of less that 10 points, between 10-56 points, and 57 points correlate with poor, moderate, and good recovery respectively. Figure 2: ARAT Scoring Sheet. Figure 3: ARAT subscale scoring. The ARAT has been shown to have strong psychometric properties. Many domains of reliability have been tested for the ARAT, with studies unanimously showing high reliability, including test-retest reliability ranging from 0.965-0.968 and inter-rater reliability ranging from 0.996-0.998. The reliability of ARAT use in the Parkinson's disease patient population has also been thoroughly tested. The test-retest reliability was found to be 0.99, with a grip reliability of 0.93 and a gross movement reliability of 0.99. The ARAT has proven to have strong validity when compared with other upper extremity function scales. Concurrent validity was shown to be high for the ARAT when the assessment was measured against the upper extremity component of the Fugl-Meyer Assessment (FMA) and the Motor Assessment Scale (MAS). In a study comparing scores on the ARAT in stroke populations with scores on the Wolf Motor Function Test, Motor Activity Log and Stroke Impact Scale, results showed good to moderate correlation, indicating a good predictive validity. The ARAT has high responsiveness and the ability to detect clinically significant changes in the motor functioning of an individual's upper extremities, particularly in stroke recovery populations. While the ARAT has many strengths, it is also plagued by limitations that can be improved upon in the future to render the tool more trustworthy and applicable to a larger population. One limitation of the ARAT is that scoring is subjective and based on the administrators’ interpretation of the client's ability to do the task, with details of test item positioning and maximum time allocated for each item omitted and open to interpretation. Scoring may also be impacted by lack of specification of the amount of time defining "abnormally long" used to differentiate a score of 2 or score of 3. Lack of standardization regarding the weight, size and source of testing materials may also result in variability in scoring. Also, while the ARAT is known for accurately measuring moderate to high degrees of motor impairments, it has shown to have poor sensitivity for measuring mild impairments. Factors that decrease the comprehension of the instructions, such as cognitive impairments or Wernicke’s aphasia, may also affect the quality of the results.